At our district, we require all varsity teams to do a community service project once during the season. The goal is to have it student-led with their thoughts and opinions. For the past few years, Nunda farmer Matt Gelser has planted pumpkins in a patch of land he owns behind the Keshequa Primary School in Dalton so that, come Halloween, students can make the short walk to the patch and pick out a pumpkin to decorate in class. This year would have been no different if not for Mother Nature, who had other plans. As fate would have it, the cultivated patch didn’t end up producing properly, so Gelser had to improvise. This is where the boys soccer team helped out. 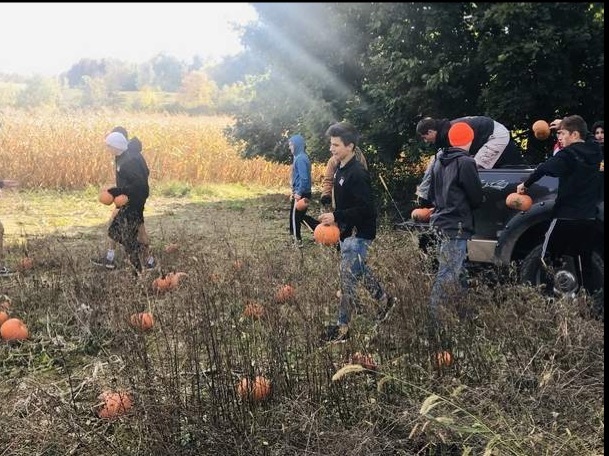 Members of the Keshequa Boys Varsity Soccer team traveled after school Thursday, Oct. 18 to one of Gelser’s pumpkin patches and lent some muscle in relocating more than 250 pumpkins to Gelser’s field behind the primary school where they were ready to be picked by students Friday. Our girls soccer team helped out at a community dinner, our volleyball team set up the book fair for our primary building and Cross Country helped with yard work and stacked pallets for community members.